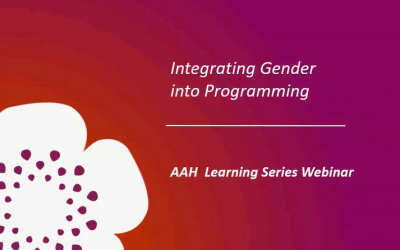 A webinar organised by Shivangi Kaushik in which Renu Golwalkar outlines the importance of integrating gender into programming, in other words: how are we applying the gender lens into our programmes and all stages of programming. Renu Golwalkar is the Director of Gender Youth and Social Inclusion for EngenderHealth, an organisation focusing on women’s health and sexual and reproductive health rights throughout Africa, Asia, and the Americas. Before joining EngenderHealth she worked for CARE India as the Head of Gender Equity and Diversity. In this webinar, Renu outlines the importance of incorporating gender into programming, such as nutrition programming. This process is referred to as ‘gender mainstreaming’ or gender integration. How can we include gender in our programs?